This is an easy low carb high protein meal for those with diabetes or for those just feeling adventurous for something unique and tasty. This dish is great by itself or with a side salad. The turmeric, cumin and cinnamon are good for digestion, blood sugar regulating and inflammation. The cashews and green beans offer delicious plant based proteins and are packed with vitamins, minerals and antioxidants. These include vitamins E, K, and B6, along with minerals like copper, phosphorus, zinc, magnesium, iron and selenium. Chop cauliflower into small florets and pulse in food processor until crumbly. In a medium sized pan add coconut oil and saute onions, carrots and green beans for 5-7 min. 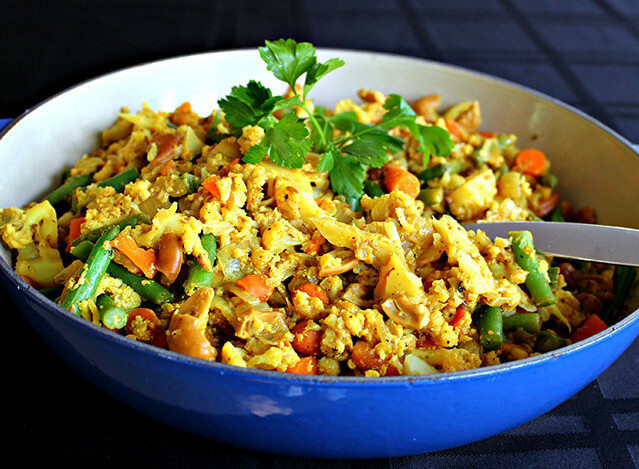 Add cauliflower, cashews and spices saute until tender and flavors are well combined. Stir in chopped cilantro and serve. Enjoy!